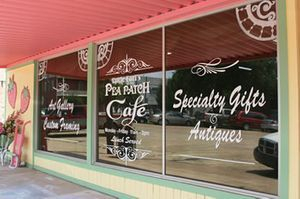 The Pea Patch Gallery and Cafe is located in historic downtown Winnfield, Louisiana. In business since 1992, it features an art gallery, gift and antique mall, custom frame shop, art studio, and Uncle Earl's Cafe. It is a great place to stop, shop and eat! Artist Gail H. Shelton's artwork is featured in the gallery and throughout the shop. She also does the custom framing and teaches art classes in the studio. The gift and antique mall is filled with various vendors with boutique clothing, purses, jewelry, decorative accessories, antique furniture, toys, spa items, and vntage decor. The Cafe serves lunch Monday through Friday from 11-2. 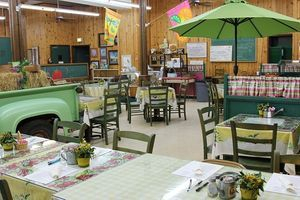 Home cooked daily specials, a salad bar, blackeyed peas and cornbread, wraps, and hot and cold sandwiches are served in a fast and friendly atmosphere, along with a 1959 green Ford pick up, and lots of Long family memorabilia. Located on the courthouse square, the Pea Patch Gallery and Cafe's bright yellow building is easy to find. Winnfield is at the crossroads of two major highways in Louisiana: Highway 167 (north and south) and Highway 84 (east and west). Come by and enjoy some lunch, some artwork, and do some shopping. We can't wait to serve you!